The use of e-prescribing systems offers gains in efficiency of communication between prescriber, pharmacy, and pharmacy benefit manager, but problems involving electronically transmitted prescriptions still exist. In 2000, the Institute for Safe Medication Practices (ISMP) authored a white paper, A Call to Action: Eliminate Handwritten Prescriptions Within 3 Years! Electronic Prescribing Can Reduce Medication Errors. The paper called for a move to electronic prescribing (e-prescribing), thus eliminating handwritten prescriptions as a contributing factor to drug communication errors. The use of e-prescribing systems offers the potential for other safety gains— integrating patient and drug information at the time of prescribing and sharing of vital patient information between pharmacist and prescriber. So, not only would illegible handwriting be removed as a problem, but more integrated information would improve the efficiency and quality of drug communication between prescriber, pharmacy, and pharmacy benefit manager—all positive effects that would benefit the patient. However, many of these anticipated gains have not yet been fully realized. Integration of e-prescribing software and electronic health records has been slow to develop. Also, as with any new technology, new types of errors may be introduced. Poorly designed e-prescribing software, allowing office staff to enter orders, and operator error have contributed to errors. While the prescriptions that are generated are legible, some have other problems that contribute to the risk of error. For example, which set of directions, those in the sig field or those in the notes field, did the prescriber want? Did the pharmacy receive all of the notes the prescriber sent or was a second page not transmitted to the pharmacy? Did the prescriber intend to change the medication or did he or she select the wrong medication on the order entry screen? 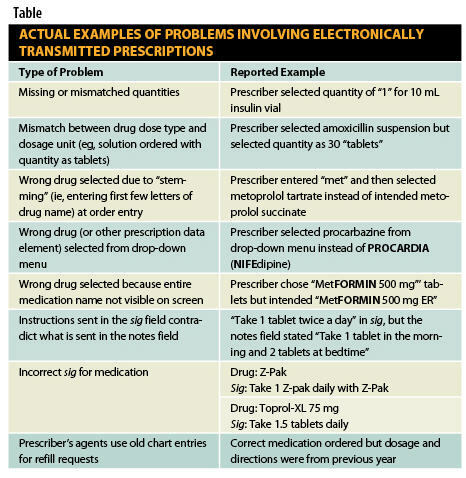 ISMP has received a number of reports describing these and other issues with electronically transmitted prescriptions. See the Table for examples of software problems submitted to the ISMP Medication Errors Reporting Program (ISMP MERP). They show that many vendor electronic systems lack safety testing. Further interaction between vendors, national portals that transfer the information, and practitioners who use the software for prescribing or dispensing is needed. Until standards for e-prescribing systems with respect to medication error prevention are developed and implemented, pharmacists should always communicate with prescribers when problems occur. Dr. Gaunt is a medication safety analyst and the editor of ISMP Medication Safety Alert! Community/ Ambulatory Care Edition.